Wear Rate Analysis is an integral part of our Fluid Analysis program that helps you maintain equipment performance and maximize availability. 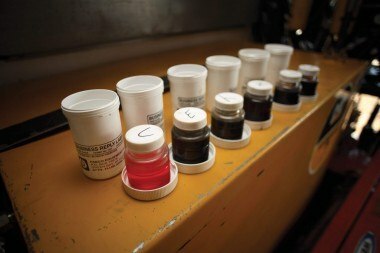 Through regularly scheduled testing of oil samples from your engine, hydraulics, and powertrain systems, Wear Rate Analysis detects tiny metal particles caused by component wear. By monitoring trends in the type and quantity of particles, you can get early warning of problems before major damage occurs. Every oil-washed system- engines, hydraulics, transmissions, and final drives- produces wear metals in everyday operation. If wear accelerates, the concentration of wear metal particles increases, signaling a problem. Wear Rate Analysis allows you to find problems before they result in major repairs or machine failure. Wear Rate Analysis can detect particles that range up to about 10 microns in size. Wear metal concentrations are expressed in parts-per-million (or ppm). Our oil analysis program tests for at least ten different substances: copper, iron, chromium, lead, tin, aluminum, molybdenum, silicon, potassium and sodium. All are wear metals found in Caterpillar machines and engines except silicon (which generally indicates dirt), potassium and sodium (which generally indicates water or coolant). Certain elements in a sample may be from the oil additive package rather than from wear within the system. Skilled dealer interpreters can tell the difference between normal elements and those that indicate abnormal wear. Two identical machines under identical conditions may generate wear particles at different rates. Our Fluid Analysis interpreters have access to a large database of samples for comparison with samples from your equipment. However, your own machines provide the best guidelines for appropriate levels of wear metals in each compartment. That is why trending is an essential part of Wear Rate Analysis. Usually after three samples have been taken from a particular compartment, a trend for each wear metal is established. Our interpreters then compare subsequent samples to this trend line to quickly spot deviations as well as minor gradual changes in concentration levels. This attention to trends also assists with life cycle analysis, helping you optimize productivity. We use an emission spectrometer to perform Wear Rate Analysis. The spectrometer determines wear elements and silicon in a sample by subjecting the oil to very high temperatures. At these temperatures, the elements in the sample are “atomized”, with each emitting a different wavelength of light energy. An optical system measures and records the light energy and calculates the results in parts-per-million for each element. By comparing infrared (Oil Condition) test results with wear metal buildup we can pinpoint probable causes of deviated wear metals. The chart below illustrates some of the most common wear metals, their source(s), and the potential problems they indicate in oil-lubricated systems. Spectrometry detects dirt contamination, as well as wear metals. Silicon is the most common element indicating dirt entry, although some clay soils also produce increased aluminum readings. When oil analysis identifies increase in the concentration of one or more metals, it can point to the wearing component most likely causing the increase and, often, the probable cause. For example, a sudden increase in copper and iron in a hydraulic oil sample would probably indicate a problem with the hydraulic pump caused by either oil degradation or contamination.